The Alliance hides in the shadows, recruiting forces and hatching conspiracies. They begin slowly and build towards a dramatic late game presence—but only if they can manage to keep the other players in check. Meanwhile, the Vagabond plays all sides of the conflict for their own gain, while hiding a mysterious quest. Explore the board, fight other factions, and work towards achieving your hidden goal. 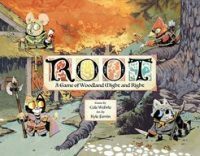 Add a Review for "Root"